The young-adult genre has been in full flow of late after the global success stories of the Twilight series and more recently, the Hunger Games franchise. Stemming from another trilogy of novels, written by Veronica Roth, comes Divergent; a sci-school adventure drama which follows teenager Beatrice Prior in a dystopian American city. To maintain order and democracy in a post-apocalyptic environment, the human race are divided into five groups, each with different strengths, weaknesses and attributes. It is a system not without flaws and when citizens can’t be pigeonholed into a category, they are hunted and killed so as not to disturb the way of the new world. Directed by Neil Burger, the first is never boring, and does well to cram in a lot filling, laying the foundations for potentially more interesting future instalments. The concept of the convoluted plot is intriguing yet completely unoriginal. It wildly blends genres and immediately becomes a lot like watching Katniss Everdeen enrolling for her first year at Hogwarts. Kate Winslet is the leader of the Erudite faction, and is the ice-queen pulling the strings, much like Jodie Foster’s role in Elysium last year. 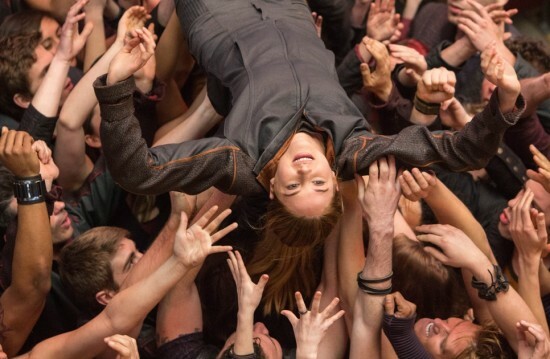 Despite the blindingly obvious comparisons, Divergent is a thoroughly entertaining watch. Highlights include the action sequences involving the Dauntless faction, an inter-railing squad of daredevils who make up the ‘brave’ category, are fun and far-fetched as they train-hop around without once buying a ticket to ride. I also liked the main character, who snappily reinvents herself as Tris. She is the latest in a long line of strong female figures in cinema and although her coming-of-age path becomes rather predictable, it is a pleasant stroll which requires very little head scratching. The futuristic set design is well presented and I enjoyed the virtual reality dream scenes which saw members of the faction take on their biggest fears. Rising starlet Shailene Woodley leads the cast as Tris Prior and has come a long way since escaping the shadow of playing Marissa’s little sister in the OC. Her mix of courage and vulnerability make her easy to root for, and she is a clear stand out amongst an otherwise average cast. The romantic co-star, Theo James, nails the moody mysterious vibe but offers nothing we haven’t seen before, failing to conjure up any real sympathy towards his character Four’s murky upbringing. It is certainly different to see Kate Winslet take on a villainous role, and her screen presence is undeniable. I only wish she upped her game a notch or two as we know she is capable of. Instead, she epitomises the PG baddie and her dark side never gets past grey. Divergent is a fine introduction to a promising series, set to be separated into four films, stretching the third book Allegiant into two films. This stands alone mostly as a necessary explanation chapter. Neil Burger has found the right tone of the genre from the off, and would relish the opportunity to take the series to the next level, though it’s been reported he is not. For a film with the tagline ‘what makes you different, makes you dangerous’, the narrative unfortunately takes a few safe options where it could have capitalised on risks. That being said, although I don’t fall into the young-adult target market category whatsoever, I am compelled to see how Shailene Woodley and her gutsy heroine will develop. This entry was posted in DVD and tagged divergent, neil burger, shailene woodley. Bookmark the permalink.